You need a quorum disk for Hyper-V Cluster. I’ll show you how to configure best quorum settings for Hyper-V Server R2. First of all, create a volume from your SAN for quorum disk. Microsoft recommends 500 mb of space for quorum disk for best ntfs performance. I give 600 mb for my quorum, then I attached same disk to all cluster nodes. Then you need to add that disk to available storage group in cluster. You don’t have to give any letter for your quorum disk. Just initialize and format your disk as a NTFS partition. Be careful, leave your disk as a Basic disk. 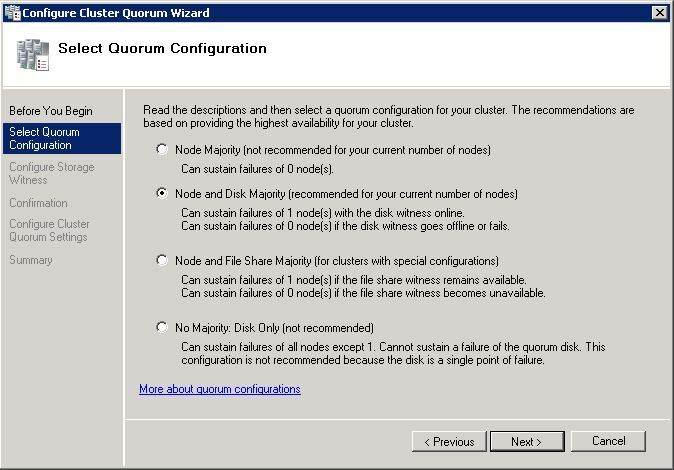 To configure your disk as a quorum disk, use “Configure Cluster Quorum Settings” under the “More Actions” menu. Choose Node and Disk Majority for the recommended Quorum configuration. Choose your Quorum disk to assign it as a witness disk. Done. Now you have a quorum disk for Hyper-V Cluster. 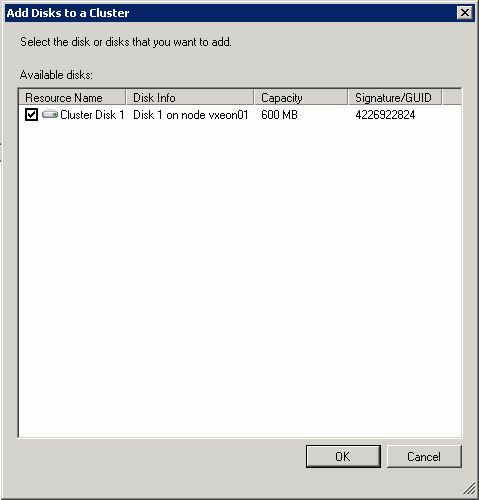 After this operation, you need to add a disk for Cluster Shared Volume. Question: I have a CSV for my cluster on my SAN configured as a Hyper-V device for both the volume and the LUN. I also have an initiator group made up of the 4 systems which make up the cluster attaching to this LUN. The CSV is available in the cluster and the volume is available on the clustered systems. So far so good. How do I define the quorum volume on the SAN? As a Windows volume, Hyper-V volume, etc.? Do I create a discreet initiator group for the quorum LUN or use the existing group? Since I have 4 devices in my cluster the preferred quorum is Node and Majority, but if I add a disk from the SAN I only get 3 of 4 systems able to connect to it. Very frustrating.